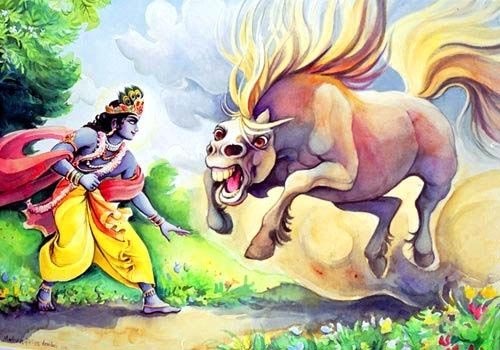 Home Hindu Festival Jallikattu Festival – Comes From Lord Krishna’s Bull Fight! Jallikattu Festival – Comes From Lord Krishna’s Bull Fight! This festival is very famous in the region of Tamil Nadu. It is considered to be one of the most significant ones among all their cultural events. It is considered to be a part of the very famous festival ‘Pongal’ and is conducted on the day of ‘Mattu Pongal’. It is also known as ‘Yeru Thazhuvuthal’ which means bull embracing. 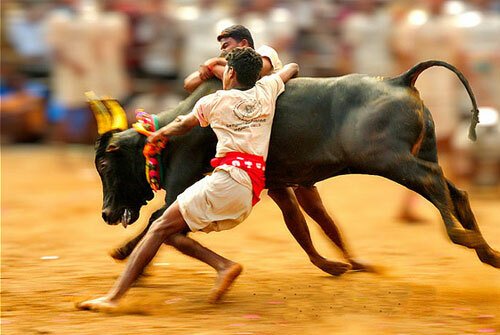 The Jallikattu festival is known by many other names such as Madu Pidithal and Pollerudhu Pidithal. The name Jallikattu means a ‘prize of coins’. This small pouch of coins is tied onto the horns of the bull which the people competing try to gain. In this ritual, a bull is released into a crowd of people. The bull is tied to a long rope and a team of players has to subdue the bull within a specific time to win. In all variants, the aim is to subdue or embrace the bull. Nowadays, people not only fight for the small bags of money but huge amounts of betting are also being done. Jallikattu, which is celebrated at Alanganallur near Madurai, is the most popular. Jallikattu bulls are exceptional. They are not much in numbers and are quite unique. These bulls descend from the Kangayam breed which is quite fierce and aggressive by nature. They are very strong than usual and have a huge sturdier build. When provoked even the slightest, they will tend to attack. Another breed popular in Jallikattu is Bangur bulls which are known for their speed. Apart from their genetic edge, Jallikattu bulls are fed very well by their owners, which makes them even stronger. Due to their unique characteristics, these are the bull used in the Jallikattu festival. 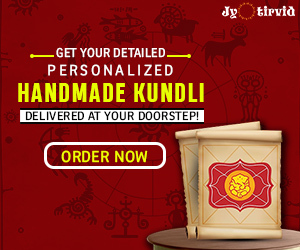 It was basically started by the ancient people of Tamil Nadu known as Aayars. They used to stay in the ‘Mullai’ region of Tamil Nadu. 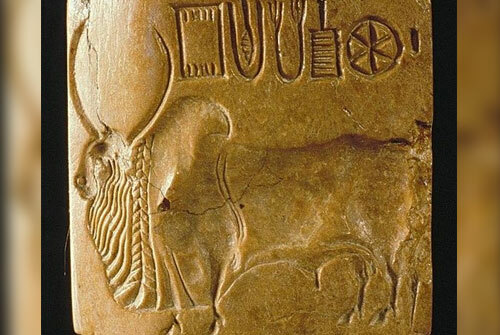 It belongs back to quite a long time and has evidence belonging to the Indus valley civilization as well. A 2,500-year-old cave painting discovered near Madurai shows a man trying to control a bull. There are references to Jallikattu in Sangam literature too. Since ages and even today, this festival is considered to be a test of masculinity. There are instances in the Dravidian literature where the winner of Jallikattu gets to marry the daughter of the village head. In Kalithogai, a later Sangam work, the poems mention young women falling in love with those who could tame the bulls. Many ask the question – “Is Jallikattu in any ways related to Hindu mythology?” You will be shocked to discover, that YES it is! Not only is it mentioned in Hindu Mythology but also has been elaborately explained in the holiest book of the Hindus – The Gita. What does the above verse mean? ‘Upon hearing these terms, the Lord tightened His clothing, expanded Himself into seven forms and easily subdued the bulls’ – According to Srila Sridhara Svami, Lord Krishna expanded Himself into seven forms not only to playfully defeat the seven bulls but also to show Princess Satya that she would not have to compete with his other queens, since he could enjoy with all of them simultaneously. A bull is first released to a crowd of people standing all ready to show their powers. 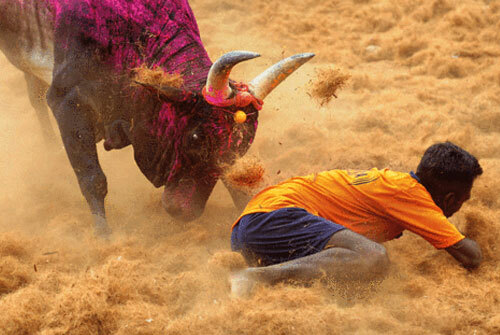 Many men try to get hold of the hump of the running bull and hang onto it while the bull tries to escape. The main aim of this ritualistic competition is that the running and enraged bull should be brought to a stop by his back humps. So, the people playing hang on to the hump as long as possible and try to stop it. In some cases to add more fascination, things like collecting flags or strips of cloth are also added. The most interesting fact of all: This particular breed of bulls is specifically bred by the people of the village for the event. 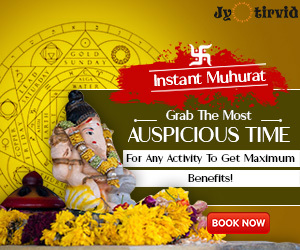 The bulls which happen to be successful in participating in the event are considered to be the precious ones and hence come at a higher price. The Bull is released to the field through the entry gate called ‘ Vadivasal’. The participant should try to ‘catch’ the bull by holding onto its hump only. The bull-tamer should hold onto the bull till it crosses the ‘finish’ line. If the bull throws the participant off before the line or if no-one manages to hold on to the bull, then the bull will be declared victorious. Else the participant is declared to be the winner. Only one participant is allowed to hold on to the bull at one time. No bull tamer can hit or hurt the bull in any manner. 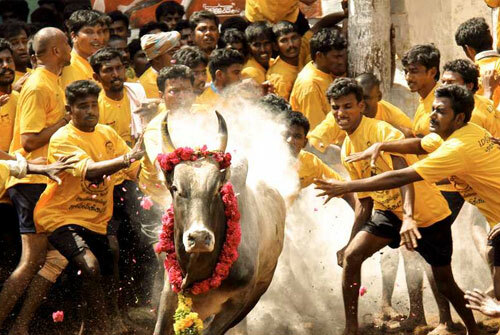 is jallikattu festival related to hinduism?